You may not know this yet, but this is just the recipe you were looking for. Because I bet you’ve always wanted to try a simple side that takes three hours to make, during which you have to patiently stay within a 2-meter-radius of the oven. I bet you’ve always thought ‘oh, that recipe sounds nice, but I wish it involved a 70% chance of burning myself’. 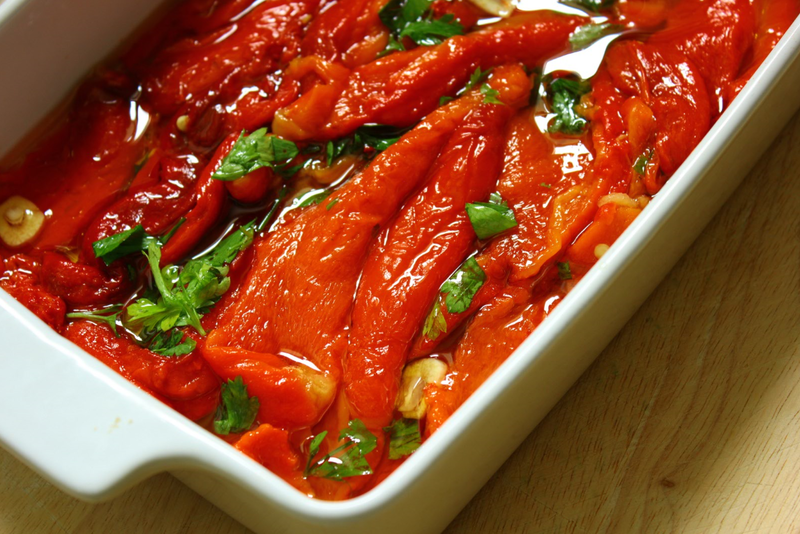 So yes, this recipe is one which feels slightly ridiculous to even jolt down and that could be condensed into one snappy line: roast some peppers. That’s it. Yet it involves complicated techniques to avoid grilling yourself, knee-length oven mitts, hours of waiting. And what you get is a side dish. A side. Not a juicy main oozing sauce, no complex flavours, no fragrant mixes of spices. This is as simple and is linear as it gets. Then why make them? Because they’re worth it, that’s why. My mum has been making these since the beginning of time (well, of my time, anyway), jewel-hued fillets of ripe peppers, bursting with flavours, the slight kick of garlic, the bright red colours in a sea of golden olive oil. This dish is what lead her to brag about the fact that her daughter ‘loved vegetables, even peppers’ (roasted into submission, doused with olive oil and on warm bread, that is). I believe raw peppers are an epidemic of our time, their sour bitterness spoiling just about everything in the salad aisle, ruining delicate cous cous, taking over sweet tomatoes, overpowering the freshest lamb lettuce, leaving an aftertaste that will stay with you long after the spinach is gone from between your teeth. But when you roast them, something utterly magical happens. They become soft, juicy, sweet, bordering on caramelised, fresh and deeply satisfying at the same time. They become the perfect side to just about everything, amazing on toast, sandwiched between two slices of crusty bread, served with some white rice, used to make a pasta salad, or just eaten straight from the fridge, so cold they hurt your teeth, the olive oil dripping onto the floor, slurped back like herrings in Holland. Set your oven to 200°, place the peppers onto baking paper in a tray and let them roast for as long as it takes, turning them every so often. They should charred, which means, well, their skin should start to turn black. They will release a lot of juice and will be very soft when they are ready. Once ready, take them out of the oven and place them in a paper or plastic bag, closed, for an hour, and try not to forget about them. But it’s fine if you do. They’ll wait for you. When they’re cold, peeling them should be easy, the skin will be peeling off like a dream. Remove the seeds and slice the pepper to create beautiful fillets. Place in a tray, cover with good quality olive oil, a couple of cloves of garlic, a little chopped parsley and cover. let the flavours mingle in the fridge for at least an hour, and serve with and on everything. Once you try them, you’ll get why that grill-shaped burn on your forearm was absolutely worth it. Next Post Salon, Brixton, and brunch.